Well, as you probably know by now, my trip to Costa Rica has been incredible so far. The first group has just left and now I have a couple days of break before the next group arrives. What an incredible experience this has been! One of the coolest things I’ve been working with on this trip is the idea of physical intuitive energy. For years I’ve been teaching people how to open their intuition, connect deeply with animals, and connect with people as well. As I teach, I do a lot with energy management, showing people how to work with their energy and emotions to put themselves into a space where they can create the best intuitive connection possible. 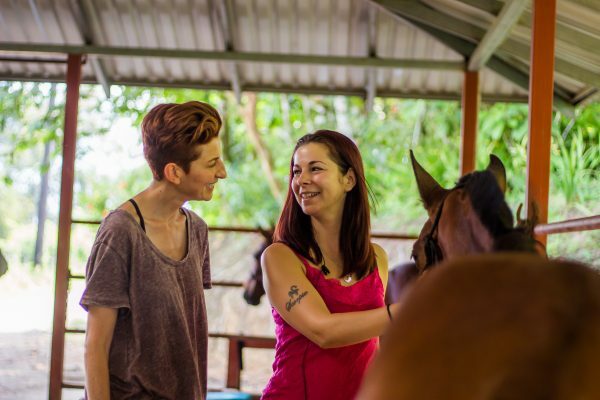 But as I’ve been working with each of the Horse and Soul participants – and as I’ve been experiencing myself, there is another type of energetic connection that actually takes the intuitive experience even further! It’s the physical intuitive connection. And it’s what I had to use in order to avoid being slammed into a telephone pole the other day. Here’s what happened: the group was on their first ride with their horses. There were 13 of us on horseback, and we were basically riding in singles and pairs as we made our way to the waterfall. Debbie, one of the other facilitators, rode up next to me and we began talking about her small cold. As we continued to ride, I took my focus off my ride with my horse, Dorado, and started intuitively checking in on Debbie. Almost immediately, Dorado started shaking his head. Then he sped up. Next he trotted really, really fast next to a telephone pole. Debbie yelled, “Don’t let him ram you into the post!” and luckily he didn’t – but it was a close call. I choked up on the reigns and focused on him again and he immediately settled down. We began walking at the regular, soft pace again and everything went back to normal. I was absolutely fascinated by what had happened. When I left my physical body presence in order to intuitively check in on Debbie, I wasn’t “present” for Dorado anymore. He did everything he could to wake up the rider on his back (i.e., me). It was this that made me realize what he was asking of me: he wanted me to be physically present as well as energetically present. It was this weird place that I wasn’t used to being. How can I be intuitive if I am in my body? At first this seemed impossible for me and for the rest of the participants – but as we progressed through the week, I experienced an unexpected outcome. Stay tuned for the next email in a couple days where I’ll explain what I’m talking about!